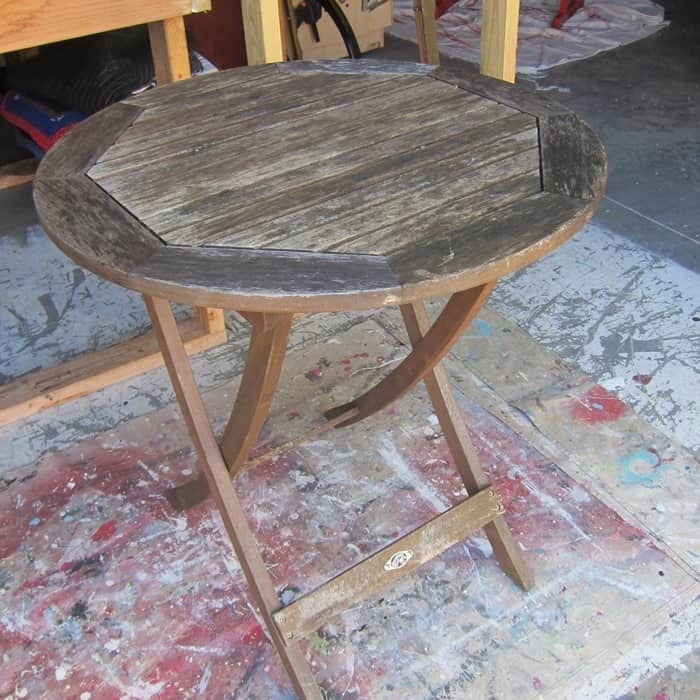 Painting This Table With 3 Paint Colors In Under 2 Hours! Yep, you heard right. 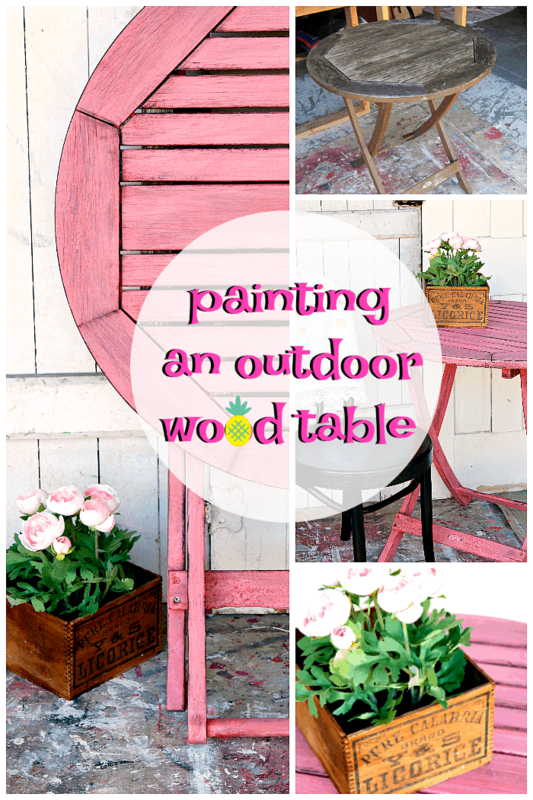 I found out I could paint a folding wood table and take all the photos in less than two hours. 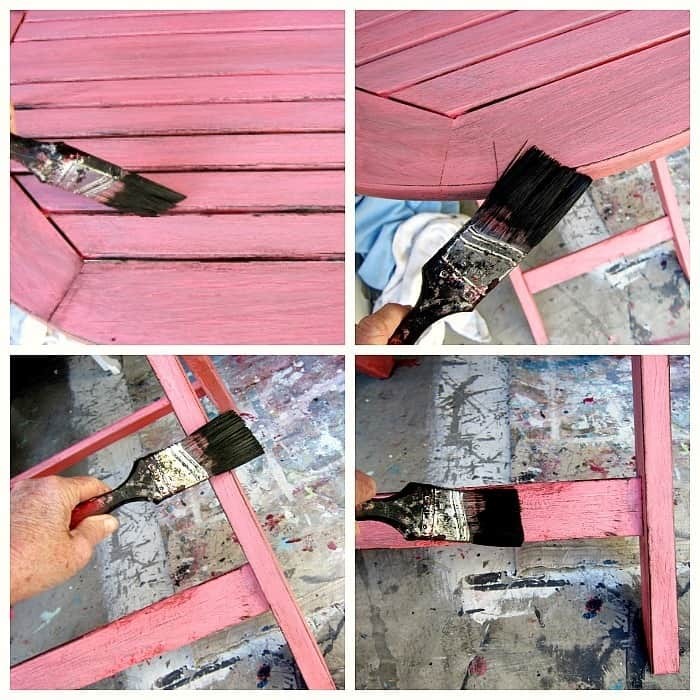 Painting furniture doesn’t have to take a ton of time. 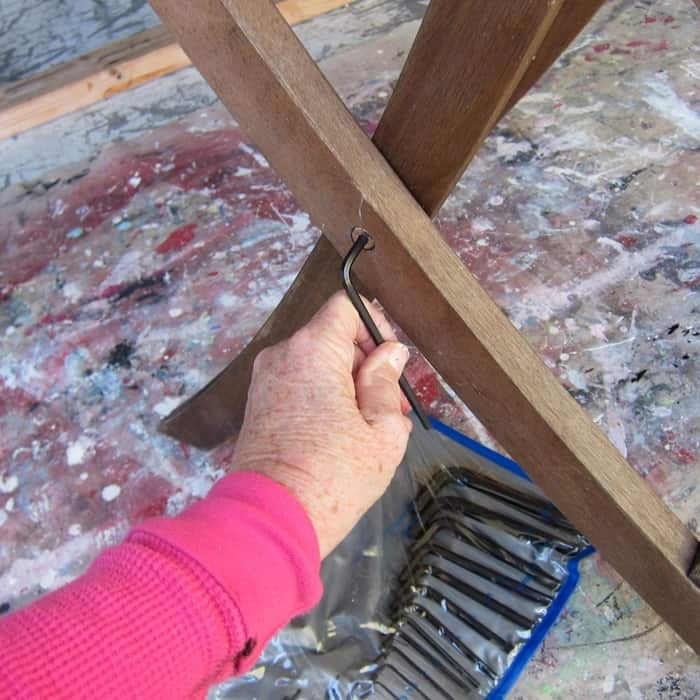 I was waiting on paint to dry on two other projects this past Saturday when my eyes fell on the outdoor folding table. I decided to start painting the table thinking it was going to be like the other two furniture projects and be around for a few days……or weeks. Well, I really got into this project and finished it up in less than 2 hours. That’s how projects go sometimes. At the bottom of the post I have a video of my thrifty junk finds from last week and I share the prices I paid for the items. 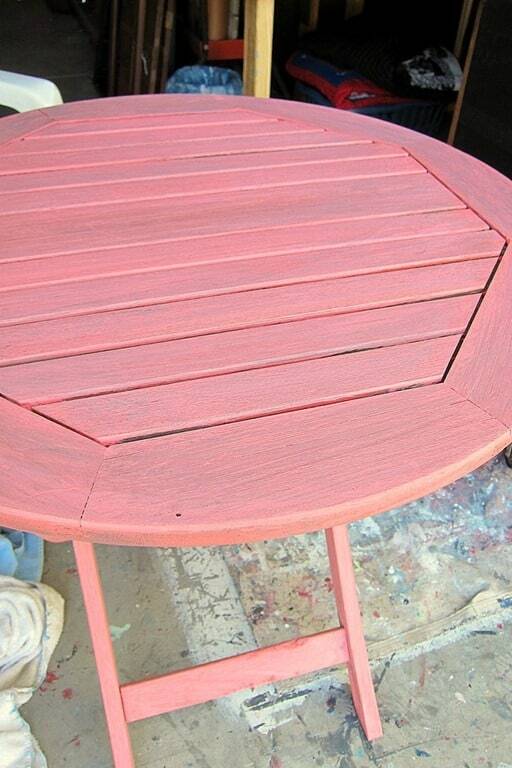 I didn’t really know how I was going to paint the table but I knew coral was going to be the color. 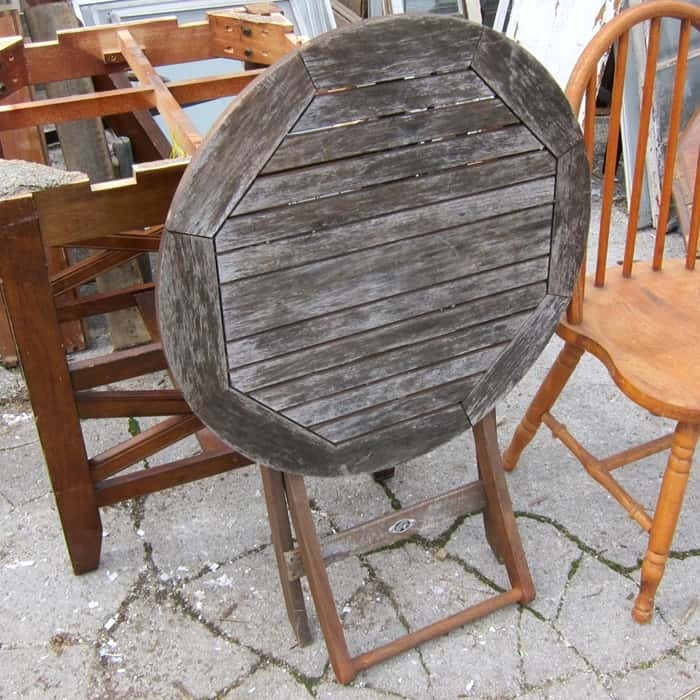 I bought the table at my favorite junk shop. I would be lost if I hadn’t found this shop years ago. It’s hard to find furniture or vintage treasures these days. The junk shop in Hopkinsville, KY is about my only source for the good stuff. I paid $16 for the folding table along with a few other small items so I would say the table was $8-$10. Not a steal but an okay deal. It had a few issues like a chewed up leg support. I guess a dog or other critter had a go at it. I tightened the screws on the legs using an Allen Wrench. 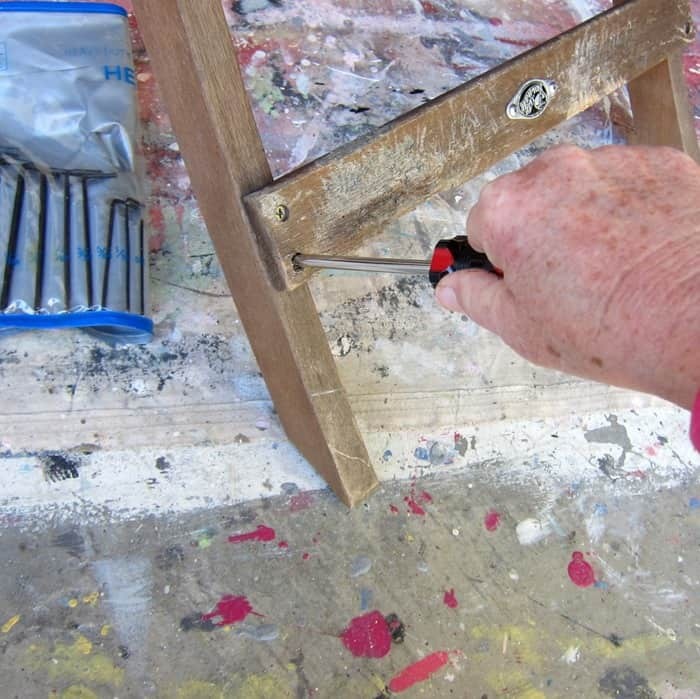 I tightened the screws on the wood leg brace using a Phillips-Head screwdriver. 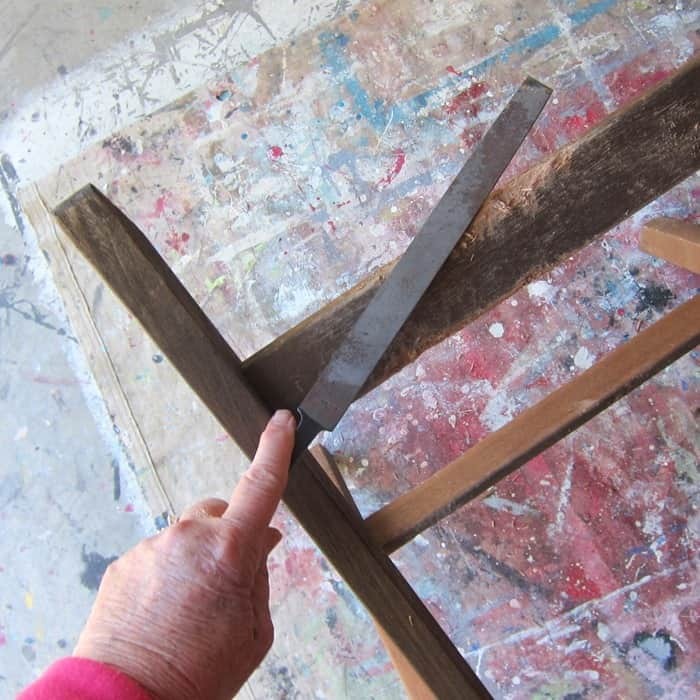 I don’t care how much tightening you do to these tables they are never completely steady. 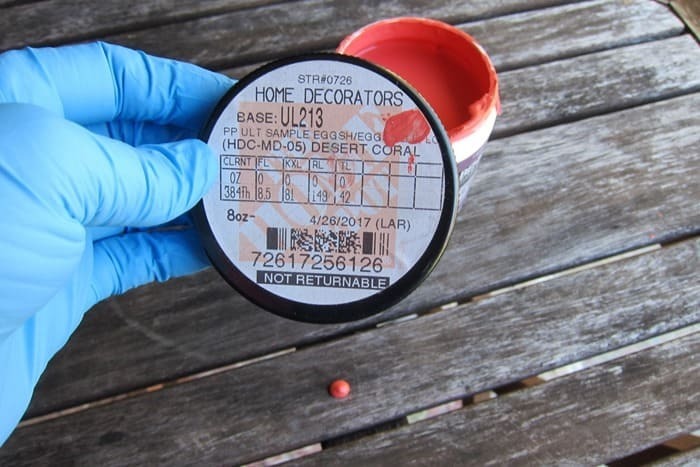 I had a sample jar of Behr coral paint I picked up at Home Depot at some point. I always check the oops paint shelf when I’m in a paint store and the samples are usually 50 cents. Can’t beat the price. 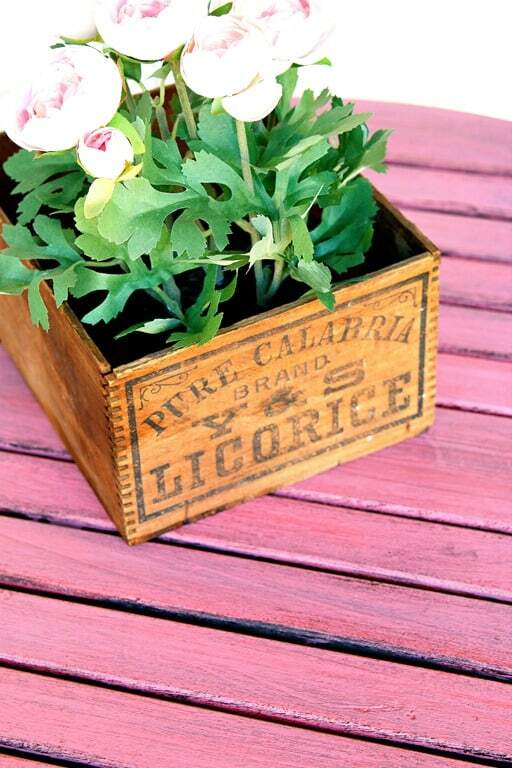 I brushed on the coral paint using my favorite FolkArt paint brush. The coral color was a little dark and muddy looking for me and I went on the hunt for other paint. 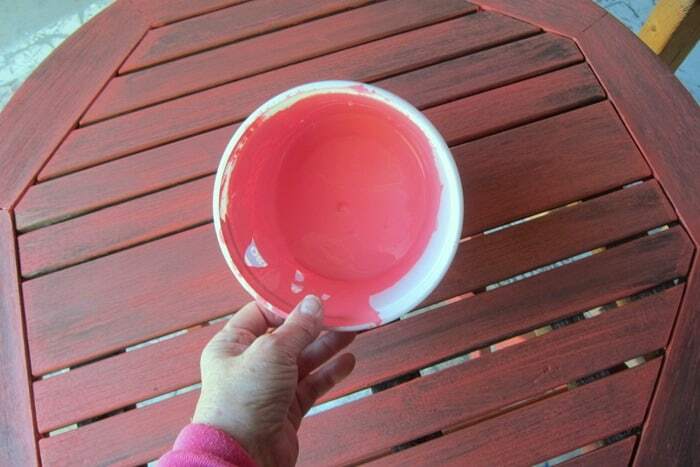 I found this cool whip bowl of coralish-pinkish paint I mixed up for an earlier project (can’t remember which one). I watered the paint down and brushed it on the table. Then I rubbed it in with a rag. Sorry, but I have no photos of this process. I forgot. When I get into a project……usually when I’m winging it…..not knowing where I’m going….I forget the photos. It takes twice as long to do my projects when taking photos of the process. I decided to highlight parts of the table with black paint. I used Beyond Paint, Licorice color and did the dry-brush technique with the black paint. That means I dipped the brush in the paint and wiped most of the paint off on a paper towel. Next I ran the brush along all of the table edges I wanted to highlight. I also ran the brush over the rough areas of the leg brace and the legs. This simple technique takes just a few minutes but adds so much. This project seriously took about two hours. My other two furniture projects are still in the works. I hope to finish them up this week. 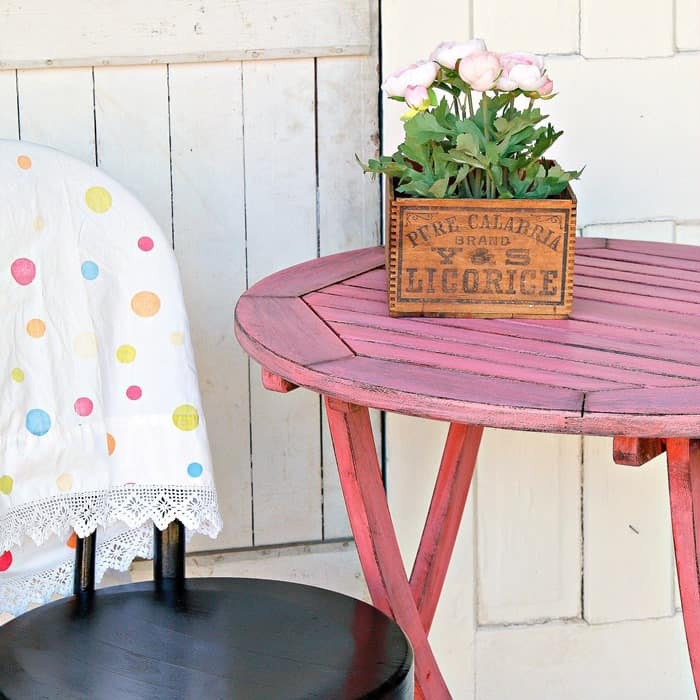 They will be totally different from this folding table and from each other. 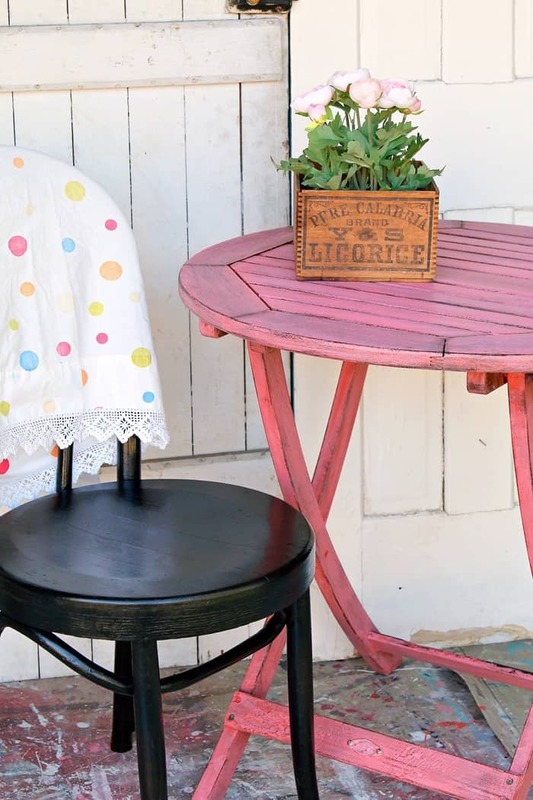 One is a vintage china hutch and the other is a drop leaf table with drawers……..colors, one red and one black. I styled the table for the photos shoot using the black chair I spray painted a couple of weeks ago, a vintage pillowcase, vintage Licorice box, and artificial flowers from IKEA. The table folds up nice and neat for storage. It looks nice all folded up. That’s my table story. The paint job was fast and the table looks great. 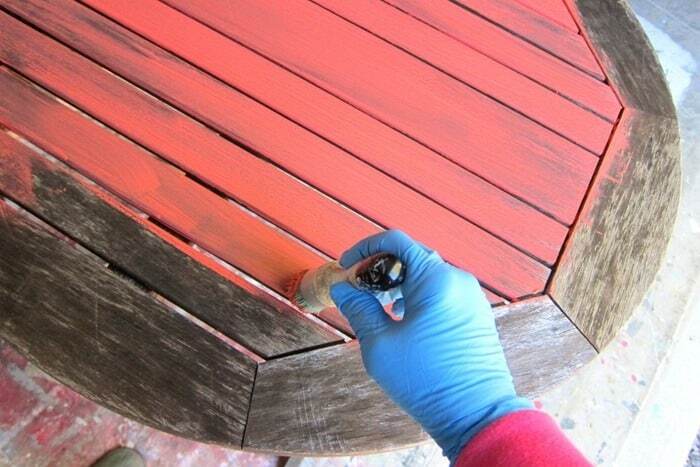 If I was going to use the table in an outdoor open space I would apply a coat or two of an outdoor sealer. Below is the video of my junk store and Goodwill purchases from last week along with the prices I paid for them. love the table. last year i did a quickie white spray paint over a table left here by my daughter. it was pink plastic with white legs. i left it out aver the winter and it peeled because i didn’t care enough to overcoat it. now, i think i’ll use some coral paint and redo it then seal it. love coral. i picked it out for my kitcken cabinets but while i was away..someone had them painted white. smh. thanks for the inspiration. Love the color of your table. I read a lot too.It relaxes me. 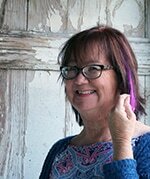 The author Janet Evanovich is a Jersey Girl (me too) who now lives in Naples, Fl. ( I live in SWFL too). I’ve read most of her books. We have a lot of thrifts stores including Goodwill in our area. I like to buy at the thrifts that give back to the community. I enjoy your projects. love the table and color you used. you don’t mention if you sanded or cleaned the table first? Thanks for reminding me Joan. I sure didn’t give that info. I wiped the table down with a dry rag. That’s it. Went to your favorite junk store today got a few things. I’m not a good picker like you. Where do you sell your stuff in Clarksville? 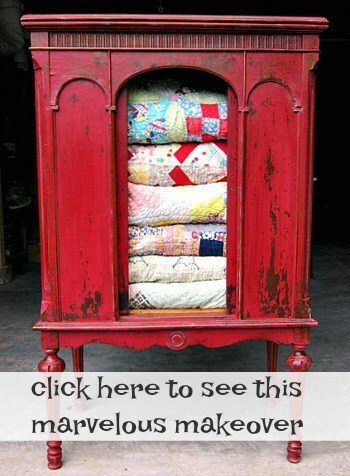 I have this metal cabinet the top has linoleum on it…how would you attach a enamel top. It is a little big? 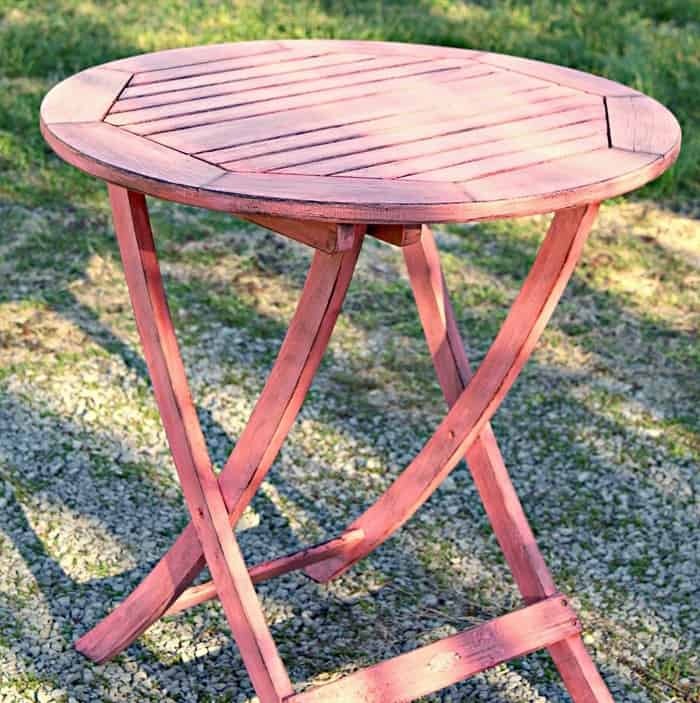 The table came out super cute, Kathy. They would look great behind a mini bar! Hum…..I checked the video Kathleen and it’s working for me. I don’t know what’s going on. Glad you like the table! I am also unable to see this video or the last one. There is no link on this page that directs me to the video. Same thing with the last one 🙁 I also tried to find it from your home page, but no luck there either. I’m sorry about the video. I am emailing you to get more info so I can figure out where the problem is. I am emailing you to get more info so I can figure out where the problem is. 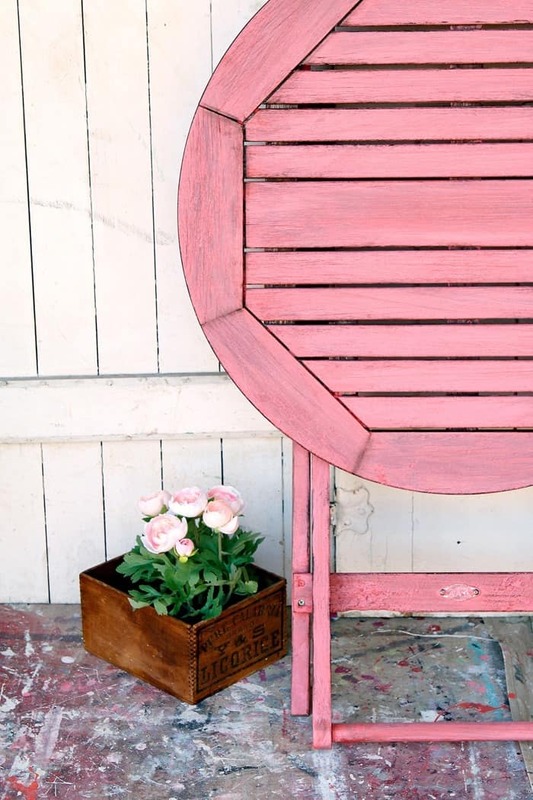 The flamingo pink colour is perfect for this piece and gives it a lovely summery feel. Very clever with the use of the black – I would never have thought of that but it does give it the special finishing touch.